Sorry for the mistpye of Roger Dubuis name on the title of my previous post. This unique time piece is the only one in the world and I am so lucky to have this watch in my collections. Just share with all of you. This watch was made in Oct. 1996 by Roger Dubuis himself and I purchased it in 1997. It uses RD27 movement and it is unique because the dial is engraved by hand and was only made one piece. I don't know who engraved this dial, maybe someone here can tell me. And the reason that I am sure that it is the only one is because it wrote the unique piece on the certificate. Very unusual and interesting Roger Dubuis, what is the model/reference number? The model is hommage. it uses RD27 movement and shows No.9. And I think it is the 9th watch which uses this RD27 movement. 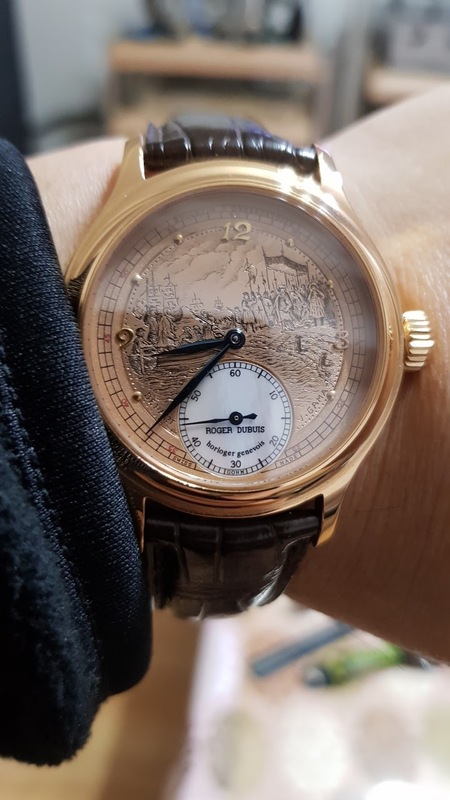 I like how he managed to keep a large portion of the dial available for engraving by putting his name in the subdial Wonderful, enjoy it! The watch is impeccable. What is despicable?? Looks nice on you I can really appreciate these older Roger Dubuis pieces. They have a lot of soul! Thanks for sharing this work of art...love the movement as well!! !